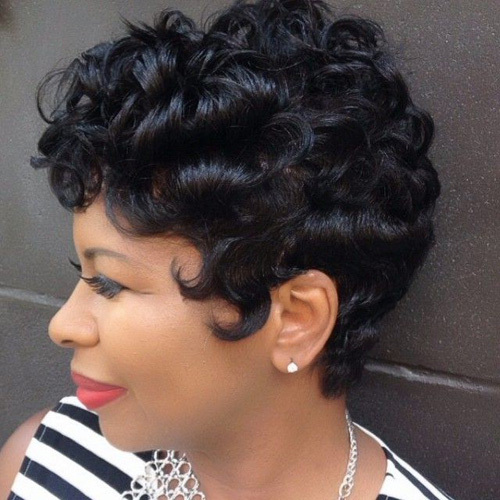 You may think of short hairstyles as being made for summer, but curly cuts like mohawks and bobs are bold style choices that can work in any season. And while many women are attached to wearing their hair long, or fear they’ll look boyish after going under the scissors, shorter cuts are the most versatile and effective in highlighting features and complimenting different face shapes. 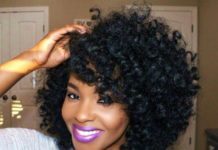 Curly styles in particular will keep your short hair looking thick and bouncy, while showing off multidimensional color and projecting a glamorous vibe that straight styles can’t compete with. 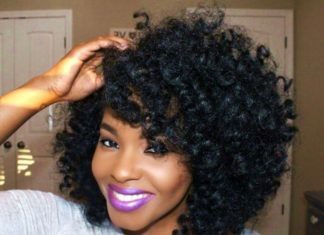 Whether you’re interested in wearing your hair all natural or using extensions to pump up your look, these 25 short and curly hairstyles for black women will provide you with plenty of ideas for your next hair makeover. 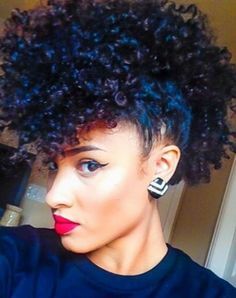 This curly style is tapered at the back and sides but features a long bang in front that particularly flatters long or square shaped faces. You can achieve this look by setting hair with small perm rods and your favorite setting lotion, but avoid hairspray to keep curls soft and bouncy. A cute style with retro flair, these Shirley Temple curls look great on any face shape. This particular version is slightly asymmetrical, which adds adult sophistication to these bouncy spiral curls. This simple twist out style creates defined, natural curls that are long lasting and help hair to retain moisture. 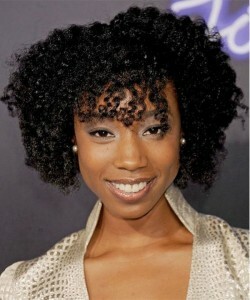 Extend your style between washes by wearing your twist outs in a high ponytail or pigtails until your next wash day. With closely cropped sides and longer hair on top, this pixie cut elongates the face, making it ideal for women with round or heart-shaped faces. 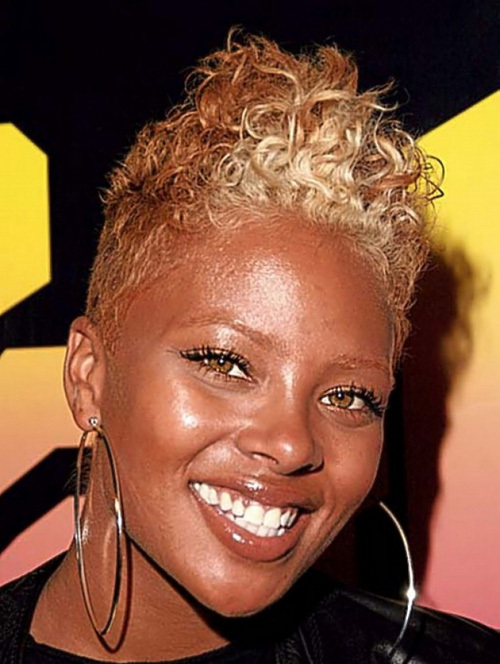 Eva Marcille’s vampy blonde color is the perfect standout shade for this edgy cut, especially on women with golden tones in their eyes and complexion. 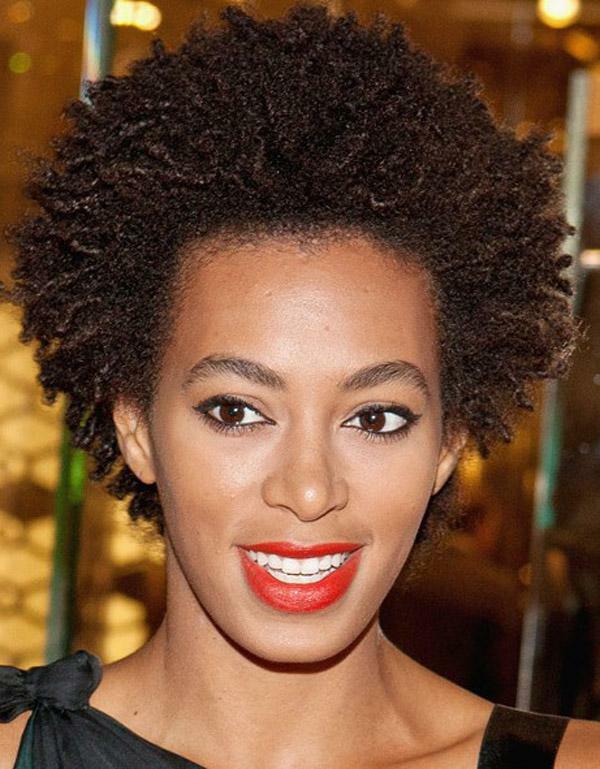 The queen of natural hairstyles, Solange’s afro style is long enough to show off texture but short enough to remain manageable. To achieve this style, add your favorite water-based leave-in, and then a sealant like shea butter. Retwist in large sections before covering with a satin scarf to maintain your style overnight. 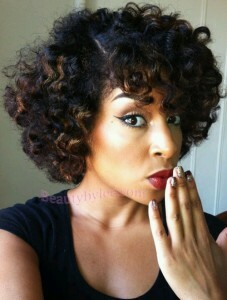 One of Rihanna’s many trendsetting styles, this spiral curl bob is perfect for any season or occasion. The stacked shape keeps hair from falling flat at the back, and long pieces in front create flirty, face-framing texture. The big curls in this short style make hair look full and thick, for a style with a retro vibe that doesn’t feel outdated. This look is polished enough to stand out for a special occasion, but can also be worn as your everyday style. Are your straight bangs ready for an update? Try these uniquely textured curly bangs that are perfect for balancing out heart-shaped faces, especially when paired with this mid-length bob. To keep this glamorous look from falling victim to bed head, keep bangs in place with a satin headband while you sleep. 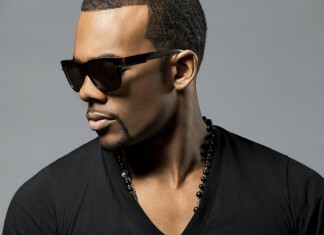 Love the mohawk style but don’t want to cut your hair? 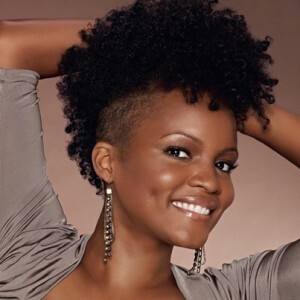 Try this super curly faux hawk that’s created by slicking hair up at the sides using your favorite curl enhancing product or gel. 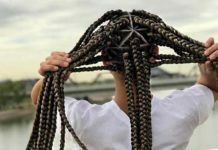 For extra interest and texture, add cornrows or twists to the sides of your hair. If you’re looking to make a drastic change, try this edgier mohawk style that takes the plunge with shaved sides, but still leaves lots of hair to play with. With the right choices in accessories and wardrobe, this mohawk transitions nicely between edgy and glam. Maybe it’s because we’re used to seeing her with long locks, but Ciara’s refreshing shorter style seems to add the perfect amount of sophistication to her look. With multi-tonal color that transitions from chestnut brown roots to a golden honey blonde, this look proves that the singer can never go wrong with warm shades in her hair. Another example of how warm, golden curls can freshen up your look, Meagan Good’s bob lands at chin length, perfectly framing and flattering her heart-shaped face. 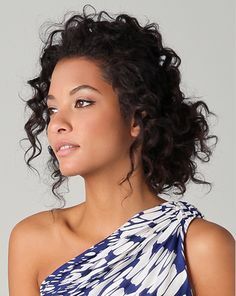 You can get these bouncy curls with a curling wand, or use a loose pin curling technique if you’re trying to avoid heat styling. Bold enough to turn heads, but deep enough to go with a variety of makeup and outfit choices, Rihanna’s intense red velvet hair color is the perfect fall shade for women with olive or dark skin tones. To keep this brilliant red from fading away, be prepared for infrequent washing and trips to the salon for color upkeep. 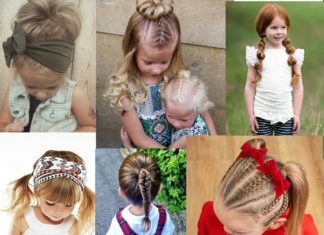 If that doesn’t appeal to you, try this style using crochet braids. If you’re looking for a super edgy style update and not afraid to lose some hair, try this short and curly mohawk cut. Rihanna’s golden honey color is a great choice for anyone wanting to bring out the warmth in their complexion or golden notes in their eyes. Contrast between the shaved sides and cascading curls that fall across the forehead, this style strikes the perfect balance between edgy and feminine. When one style of curls isn’t enough for you, try this style with finger waved roots that gradually transition into spiral curls. This understated color has subtle hints of red and brown undertones that sparkle in the sunlight but don’t overpower the look. 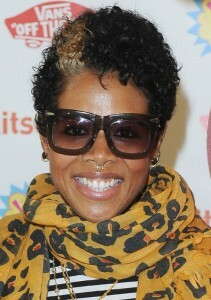 Though once known for rocking big hair, Kelis looks chic in this short and curly boy cut. A big upcoming trend in both women’s and men’s hairstyles, this patch of accenting blonde color is a unique, artistic take on a two toned style. 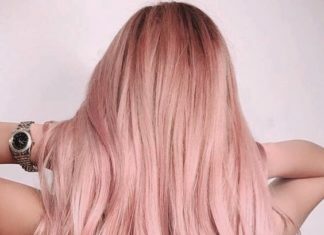 To add even more interest, try using a semi-permanent color like pink or blue over the already blonde section. For short haired women who want to try a different styling method, throw it back to the ’90s with this honey colored finger wave style. 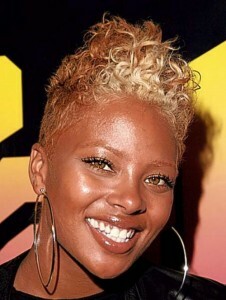 To look as good as Halle Berry, pair this look with fresh faced makeup in neutral tones, and lots of gold accessories. 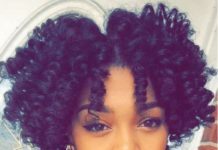 For women with natural hair, a bantu knot out style is an easy go-to method for achieving a head full of curls. To get this look, twist dampened hair into bantu knots, and let them dry completely (either air drying or with a heat source) before gently taking out. 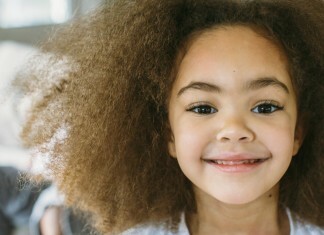 These dense, springy curls will really pop if you’ve got highlights in your hair. 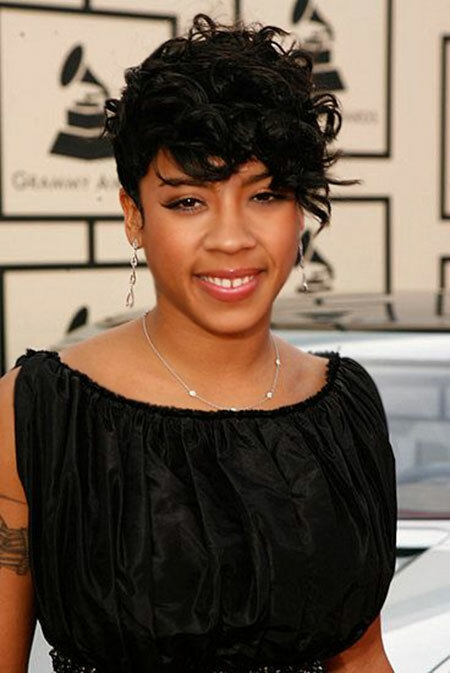 Known for wearing a variety of hairstyles in every color under the sun, singer Keyshia Cole looks timeless and sophisticated in this simple black tapered pixie with long bangs. 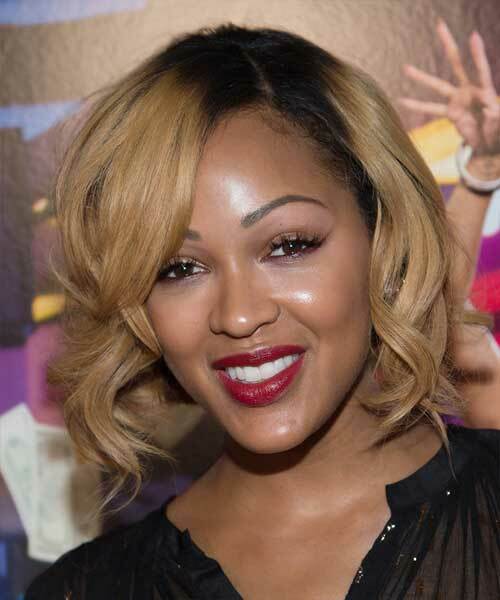 This style is perfect for women who are trying to soften angular features, and could be easily updated with an auburn or copper color for fall. 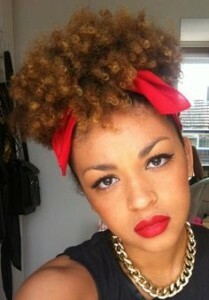 Natural hair puffs are one of the easiest styles to achieve, and can be done with almost any hair length. Perfect for any woman on the go, hair stays out of the way while showing off it’s natural texture. 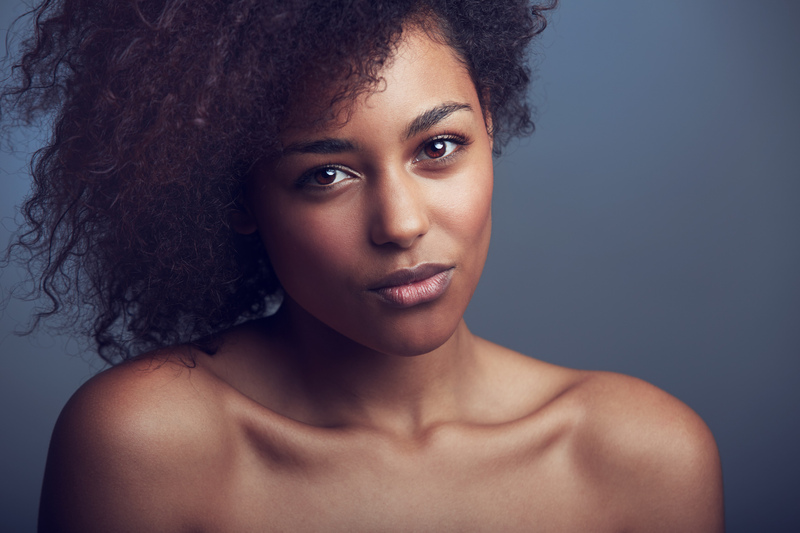 To combat dryness and tangling, be sure to moisturize and twist your hair at night. How gorgeous does Ciara look in this shoulder length curly lob? Her dark brown roots and multi-tonal honey blonde color add tons of dimension to make this look perfect compliment her skin tone. If you’re afraid of bold, blonde hair, take notes from Gabrielle Union, who shows how women with deeper skin tones can sport blonde in their locks. This chestnut brown hair with honey highlights throughout features enough color contrast to accentuate these large, face-framing curls. Fake it ’til you make it with this cute, no cutting required faux hawk. Get the look by slicking back one side of your hair, while styling hair on top with tons of curls. Although the mohawk is a traditionally edgy style, this faux version won’t look out of place on your next dinner date or as a wedding guest. For a next day style on your hair that’s already been curled, pulling locks into a messy low bun is a great way to quickly and effortlessly look put together. Touch up curls using a curling wand, or plan ahead the night before by setting hair with perm rods. 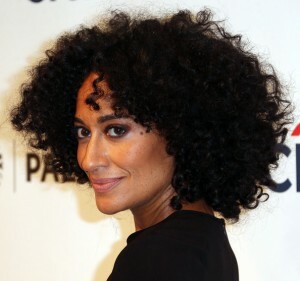 If you’d like to embrace your kinks like Tracee Ellis Ross, try wearing your hair in a simple wash and go style. To preserve your style in between washings, secure hair in a pineapple or twist into a satin scarf while you sleep. In the morning, refresh your hair with water and glycerin, then seal with your favorite oil.